Kale (Brassica oleracea) one of the most nutrient-dense foods available, is a very good source of Vitamin K, Vitamin A, Vitamin C, Vitamin B6, calcium, potassium, copper and manganese. It also contains dietary fiber, thiamin, riboflavin, folate, iron, magnesium and phosphorus. 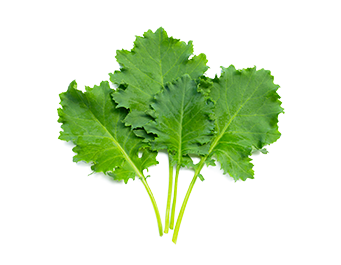 Kale has numerous compounds that may be beneficial to health, such as indole-3-carbinol, which may support colon health, and also sulforaphane, which has been shown to be beneficial for cardiovascular health.